It's time to rise above your limits. It's time to redefine possible. Allysian's team of experts has come together to create the world's most powerfully enhanced coffee. 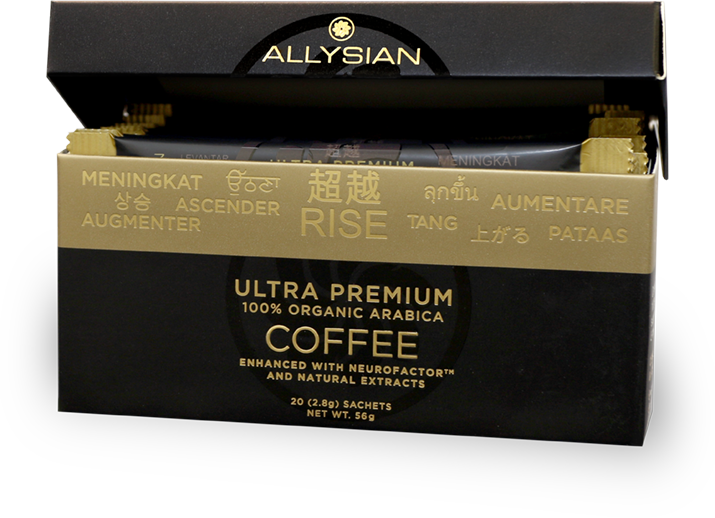 Certified fair trade and organic, Allysian Rise releases the robust flavours of 100% Arabica coffee crystals, enhanced with clinically supported natural extracts such as Neurofactor™. 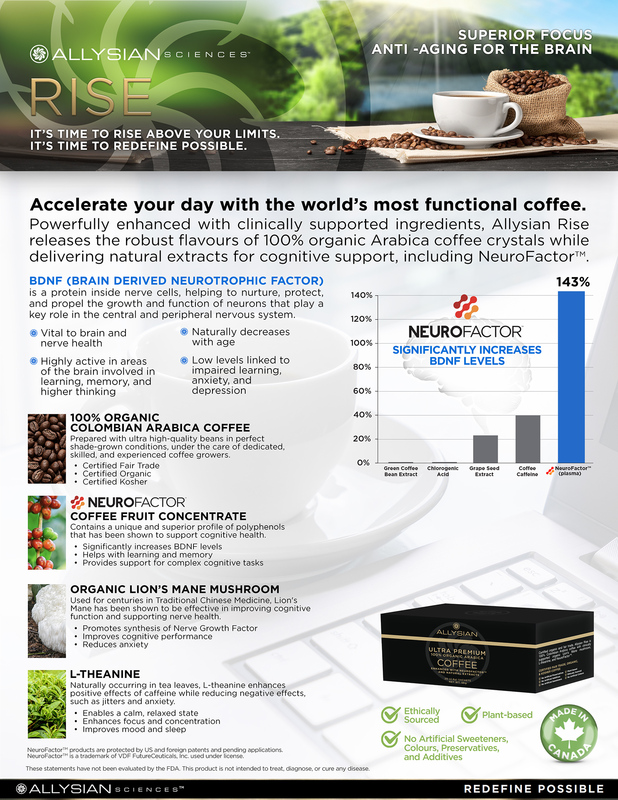 Allysian Rise is composed of a synergistic blend of active ingredients in the perfect proportions and optimal potencies to stimulate the production of neuroprotective factors, including BDNF (Brain Derived Neurotrophic Factor), that are vital to learning, memory, and overall brain health. Our team of experts sampled coffees from all around the world and came to a unanimous decision on 100% Arabica beans. The combination of perfect growing conditions, ultra high-quality beans, and highly dedicated and skilled coffee growers, means a premium coffee with a deliciously robust flavour profile. 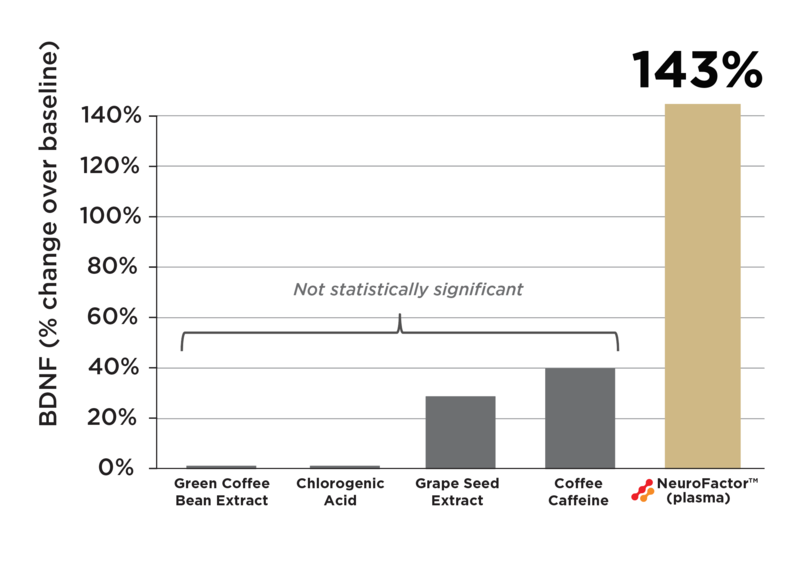 Patented by the undisputed world leaders in the research of coffee fruit. Selectively hand-picked at their nutritional peak, providing a unique and superior profile of polyphenols to support cognitive health. BDNF is a protein inside nerve cells, helping to nurture, protect, and propel the growth and function of neurons that play a key role in the central and peripheral nervous system. NeuroFactor™ products are protected by US and foreign patents and pending applications. NeuroFactor™ is a trademark of VDF FutureCeuticals, Inc. used under license. Acheson, A., Conover, J.C., Fandl, J.P., DeChiara, T.M., Russell, M., Thadani, A., et al. (1995). A BDNF autocrine loop in adult sensory neurons prevents cell death. Nature, 374(6521), 450-453. Bekinschtein, P., Cammarota, M., Katche, C., Slipczuk, L., Rossato, J.I., Goldin, A., et al. (2008). BDNF is essential to promote persistence of long-term memory storage. Proceedings of the National Academy of Sciences of the United States of America, 105(7), 2711-2716. Binder, D.K., & Scharfman, H.E. (2004). Brain-derived neurotrophic factor. Growth Factors, 22(3), 123-131. Dinoff, A., Herrmann, N., Swardfager, W., & Lanctot, K.L. (2017). The effect of acute exercise on blood concentrations of brain-derived neurotrophic factor (BDNF) in healthy adults: a meta-analysis. Eur J Neurosci. doi:10.1111/ejn.13603. Makhathini, K.B., Abboussi, O., Stein, D., Mabandla, M.V., & Daniels, W.M.U. (2017). Repetitive stress leads to impaired cognitive function that is associated with DNA hypomethylation, reduced BDNF, and a dysregulated HPA axis. Int J Dev Neurosci. doi:10.1016/j.ijdevneu.2017.04.004. Pencea, V., Bingaman, K.D., Wiegand, S.J., & Luskin, M.B. (2001). Infusion of brain-derived neurotrophic factor into the lateral ventricle of the adult rat leads to new neurons in the parenchyma of the striatum, septum, thalamus, and hypothalamus. The Journal of Neuroscience, 21(17), 6706-6717. Reyes-Izquierdo, T., Argumedo, R., Shu, C., Nemzer, B., & Pietrzkowski, Z. (2013). Stimulatory effect of whole coffee fruit concentrate powder on plasma levels of total and exosomal brain-derived neurotrophic factor in healthy subjects: an acute within-subject clinical study. Food and Nutrition Sciences, 4, 984-990. Reyes-Izquierdo, T., Nemzer, B., Shu, C., Huynh, L., Argumedo, R., Keller, R., & Pietrzkowski, Z. (2013). 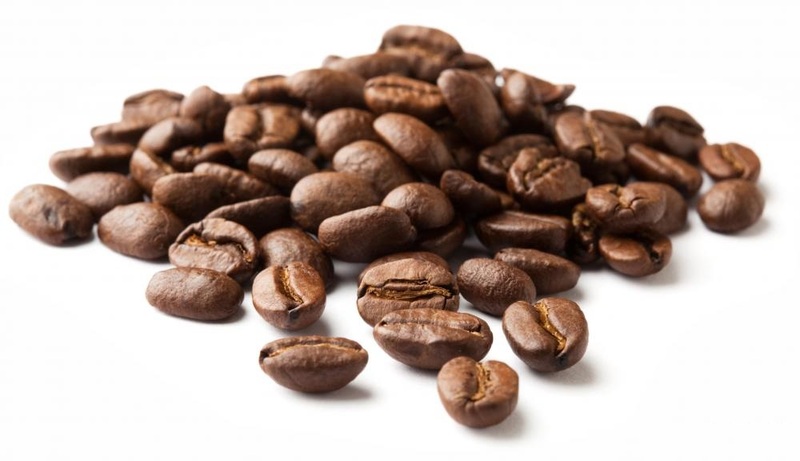 Modulatory effect of coffee fruit extract on plasma levels of brain-derived neurotrophic factor in healthy subjects. British Journal of Nutrition, 110(3), 420-425. Sleiman, S.F., Henry, J., Al-Haddad, R., El Hayek, L., Haidar, E.A., Stringer, T., et al. (2016). Exercise promotes the expression of brain derived neurotrophic factor (BDNF) through the action of the ketone body B-hydroxybutyrate. Elife. doi:10.7554/eLife.15092. Yamada, K., & Nabeshima, T. (2003). Brain-derived neurotrophic factor/TrkB signaling in memory processes. Journal of Pharmacological Sciences, 91(4), 267-270. 11. Zigova, T., Pencea, V., Wiegand, S.J., & Luskin, M.B. (1998). Intraventricular administration of BDNF increases the number of newly generated neurons in the adult olfactory bulb. Molecular and Cellular Neurosciences, 11(4), 234-245. Enjoyed as a food in Japan and China and used for centuries in traditional Chinese medicine, Lion's Mane has been shown to be effective in improving cognitive function and supporting nerve health. In a 2009 study, older adults with mild cognitive impairment who took Lion's Mane for 16 weeks had significant improvements in cognitive function tests when compared to placebo. Allen, S.J., & Dawbarn, D. (2006). Clinical relevance of the neurotrophins and their receptors. Clinical Science, 110(2), 175-191. Althaus, H.H. (2004). Remyelination in multiple sclerosis: a new role for neurotrophins? Progress In Brain Research, 146, 415-432. Chaldakov, G.N., Tonchev, A.B., & Aloe, L. (2009). NFG and BDNF: from nerves to adipose tissue, from neurokines to metabokines. Rivista Di Psichiatria, 44(2), 79-87. Lai, P.L., Naidu, M., Sabaratnam, V., Wong, K.H., David, R.P., Kuppusamy, U.R., Abdullah, N., & Malek, S.N. (2013). Neurotrophic properties of the Lionâs mane medicinal mushroom, Hericium erinaceus (Higher Basidiomycetes) from Malaysia. Int J Med Mushrooms, 15(6), 539- 554. Mori, K., Inatomi, S., Ouchi, K., Azumi, Y., & Tuchida, T. (2009). Improving effects of the mushroom Yamabushitake (Hericium erinaceus) on mild cognitive impairment: a double-blind placebo-controlled clinical trial. Mori, K., Obara, Y., Moriya, T., Inatomi, S., & Nakahata, N. (2011). Effects of Hericium erinaceus on amyloid B(25-35) peptide-induced learning and memory deficits in mice. Biomed Res, 32(1), 67-72. Nagano, M., Shimizu, K., Kondo, R., Hayashi, C., Sato, D., Kitagawa, K., & Ohnuki, K. (2010). Reduction of depression and anxiety by 4 weeks Hericium erinaceus intake. Biomed Res, 31(4), 231-237. Tuszynski, M.H., & Blesch, A. (2004). Nerve growth factor: from animal models of cholinergic neuronal degeneration to gene therapy in Alzheimer's disease. Progress In Brain Research, 146, 441-449. Tuszynski, M.H., Yang, J.H., Barba, D., U, H.S., Bakay, R.A., Pay, M.M., et al. (2015). Nerve growth factor gene therapy: activation of neuronal responses in Alzheimer disease. JAMA Neurology, 72, 1139-1147. Villoslada, P., & Genain, C.P. (2004). Role of nerve growth factor and other trophic factors in brain inflammation. Progress In Brain Research, 146, 403-414. An amino acid naturally occurring in tea leaves, known to significantly promote relaxation and focus, improve sleep and mood, and reduce stress and anxiety. L-theanine works synergistically with caffeine, enhancing the positive effects while reducing tiredness, headaches, and jitteriness. In a 2012 study of healthy adults, those who took a single administration of L-theanine experienced reduced tension and anxiety scores, compared to placebo. Einother, S.J., Martens, V.E., Rycroft, J.A., & De Bruin, E.A. (2010). L-theanine and caffeine improve task switching but not intersensory attention or subjective alertness. Appetite, 54(2), 406-409. Foxe, J.J., Morie, K.P., Laud, P.J., Rowson, M.J., de Bruin, E.A., & Kelly, S.P. (2012). Assessing the effects of caffeine and theanine on the maintenance of vigilance during a sustained attention task. Neuropharmacology, 62(7), 2320-2327. Giesbrecht, T., Rycroft, J.A., Rowson, M.J., & De Bruin, E.A. (2010). The combination of L- theanine and caffeine improves cognitive performance and increases subjective alertness. Nutr Neurosci, 13(6), 283-290. Haskell, C.F., Kennedy, D.O., Milne, A.L., Wesnes, K.A., & Scholey, A.B. (2008). The effects of L- theanine, caffeine and their combination on cognition and mood. Biological Psychology, 77(2), 113-122. Higashiyama, A., Htay, H.H., Ozeki, M., Juneja, L.R., & Kapoor, M.P. (2011). Effects of L- theanine on attention and reaction time response. Journal of Functional Foods, 3(3), 171-178. Kahathuduwa, C.N., Dassanayake, T.L., Amarakoon, A.M., & Weerasinghe, V.S. (2016). Acute effects of theanine, caffeine and theanine-caffeine combination on attention. Nutr Neurosci. doi: 10.1080/1028415X.2016.1144845. Owen, G.N., Parnell, H., De Bruin, E.A., & Rycroft, J.A. (2008). The combined effects of L- theanine and caffeine on cognitive performance and mood. Nutr Neurosci, 11(4), 193-198. Rogers, P.J., Smith, J.E., Heatherley, S.V., & Pleydell-Pearce, C.W. (2008). Time for tea: mood, blood pressure and cognitive performance effects of caffeine and theanine administered alone and together. Psychopharmacology (Berl), 195(4), 569-577. Timmcke, J.Q., Juneja, L.R., & Kapoor, M.P. (2008). Efficacy and short-term safety of L- theanine in randomized, double-blind, parallel-group study. The FASEB Journal, 22(2). Yoto, A., Motoki, M., Murao, S., & Yokogoshi, H. (2012). Effects of L-theanine or caffeine intake on changes in blood pressure under physical and psychological stresses. J Physiol Anthropol, 31(1), 28-36. Dissolve 1 sachet into a 240 mL (8 fl oz.) cup with hot water. Stir and enjoy. "Accelerate your day with the world's most functional coffee." † &ast; These statements have not been evaluated by the Food and Drug Administration. This product is not intended to diagnose, treat, cure, or prevent any disease.